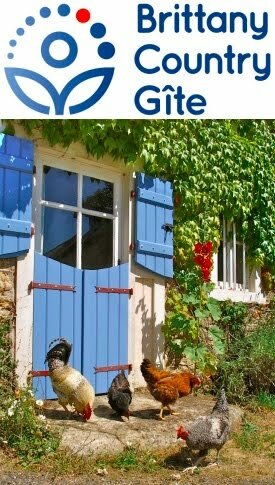 permaculture in brittany: Permaculture ideas : A help or a hindrance ? Permaculture ideas : A help or a hindrance ? Permaculture is a design system. It involves looking at nature and seeing what works and how it works and then applying some of that inherent wisdom to how we design our own food production systems. One connects things, juxtaposes them, and then basks in their productive symbiosis, two for the price of one. To the north of our potager (vegetable plot) we have our willow plantation, several rows of thirty two different varieties which, along with providing bees with an early and continuing source of nectar and rods for living willow structures, acts as a windbreak to our veggies from the cold dry winds that blow from the north. To the east, we have a couple of black locust / false acacia (robinia pseudoacacia) trees, which were principally planted to obscure the slabby grey wall of our neighbour’s house. Both of these trees could be classified as pioneer trees—trees that move in first to untended ground, the first step towards natural reforestation—and are very competitive. They chuck out energetic roots that go hunting for nutrients and water. Serge, our helpful neighbour, has delivered us another load of chestnut planking that he has torn out of a building renovation and rescued from the site bonfire. 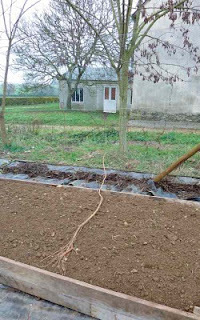 This meant that I was able to enclose another four raised beds in the potager and in all the preparatory digging and clearing of the pathways, I discovered some roots. Blooming scary, great long, strong ropes of roots, thick as a man’s wrist (well, finger, I exaggerate!) and running a long way into the vegetable growing area. One of the disadvantages of raised beds is that they dry out quicker and last summer was exceptionally dry, so to have tree roots pumping out what’s left of the precious humidity that remains isn’t desirable. But wait. 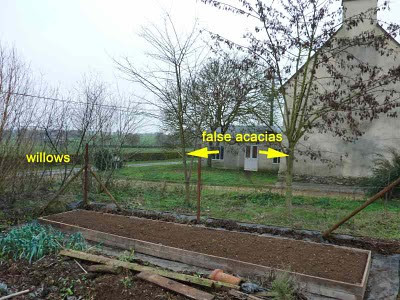 The roots of false acacia are nitrogen fixing, feeding other plants … hmm. 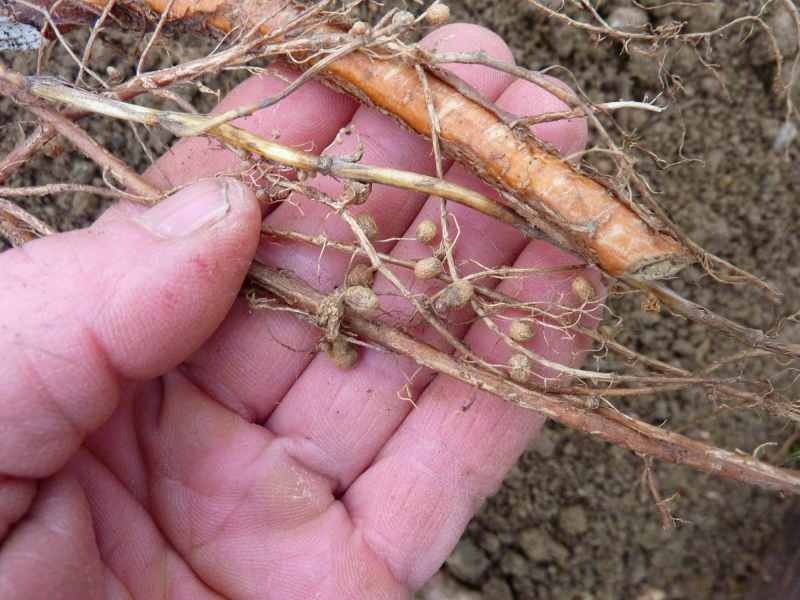 It’s a legume, so the roots have nodules (see photo) containing nitrogen-fixing nitrogen bacteria. So, the permaculture questions: do the vegetables gain more from the windbreak effect than the water they lose to thirsty willow roots? and do they gain more from nitrogen fixation than they lose from thirsty false acacia roots? In short, I don’t know but it’s an interesting conundrum. Practically, we plan to progressively remove the first few rows of willows, to retain some windbreak effect but at a distance and we only have two false acacias, so we’ll keep an eye on the relative humidity of the closest bed relative to others to see if the roots are unfavourably drying out the bed. For me, permaculture is a “work in progress” and all the more useful thought of like that. Is it possible to direct more water into this area (or increase water retention ability of the soil) or build something that will also work as a root barrier between willows and the veggies? Just 2 first things that came to my head. Since the willows do perform at least a couple of important functions there, I'd first look for solutions other than removal. Also (a bit unrelated to this situation, I guess) I don't think raised beds' advantages outweight their drawbacks where water is scarce. "Reversed" raised beds (that is, sunk into the ground) and hugelkultur type stuff seems to work much better for us, for example (central FL, very sandy soils and 49" of rain/year). I enjoy reading your blog and gleaning bits of info to use in my own gardens. We had black locust trees at the farm where I grew up. Their blossoms are great for bees early-ish in the season. We call them the fence post tree. They were grown here to be used for fence posts because they will last a year longer than stone. They also grow very quickly. In your situation, that could be a drawback. Those wrist sized (well, finger sized) roots could quickly become wrist sized. The black locust is my favorite tree, so I hope you keep them around. If it helps we had a mixed row of Willow and Hazel next to Rhubarb plants. The willow were swamping the Hazel so we cut down the willow and the Hazel has done much better but also the Rhubarb has produced considerably more following the Willows removal. The remaining hazel plants do not seem to be affecting Rhubarb growth too much. Thanks Leon, Ann and Phil, for stopping by to leave your comments. Leon, I often have the fantasy of starting over, but now with the knowledge that we've learning over the past five years. I'd definitely use some earth moving equipment at the start to set things up and a root barrier is a great idea. As for the raised beds, they're great for my bad back. The soil is good at retaining moisture, so we need to mulch and monitor our watering strategy during the driest times, i.e., proper soaks every few days, rather than wetting the surface more regularly. Ann, we're fans of black locust too. We're trying to move another that we put to frame the entrance to our property (as they are so pretty) but which will cause problems with a living willow fedge (fence/hedge) and the polytunnel and it's NOT EASY at all! If we can get it out alive, it's going into the new forest garden. Phil, thanks for your own observations. I need to email you to ask you advice on a couple of things, such as pasture management. Nice to see you back blogging after a break of a few months. > I'd definitely use some earth moving equipment at the start to set things up and a root barrier is a great idea. It may be not to late to do a root barrier though - you dig a narrow trench about 1 meter deep (YMMW) and pour concrete into it. Since you don't need much structural strength here, you can use empty bottles and such as fill, as long as front and back of the barrier don't have any holes. Should be doable. > As for the raised beds, they're great for my bad back. We've just used an earth mover / mechanical digger, to do some landscaping at the front of our property, removing some huge tree stumps and a low concrete wall, then levelling what was left. A farming neighbour then ran his rotating harrow over it, which further smoothed it and made the soil suitable for sowing grass seed The digger driver doesn't live far away and just charges for his hours, i.e., no call-out fee to start with. 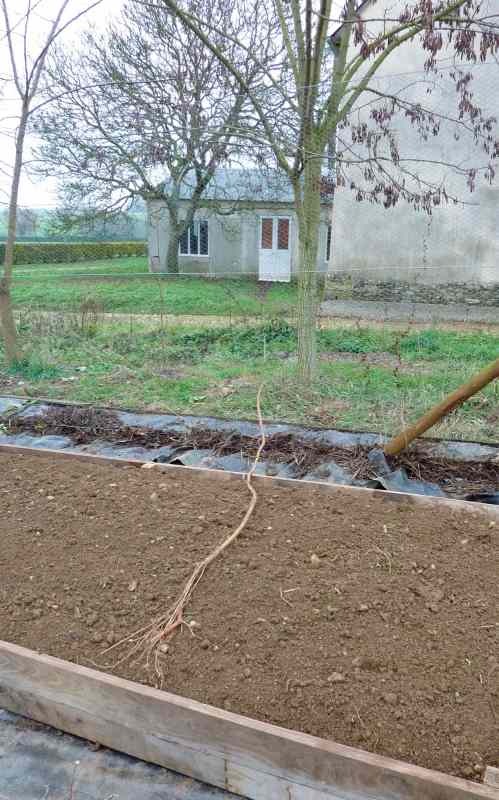 So I'm pretty taken with the idea of earth moving plant used at the right moments to contribute to a permaculture design, even the plough and harrow, if only to prepare the land thoroughly for a no-dig future. The root barrier sounds like a good idea. Whether we install one there or just bear in mind for the future, I'm not sure. I think I'd rather adapt the choice of plant to the situation but it's a good extra tool if the situation absolutely calls for a specific plant in a specific place and the roots might be problematic.